Last Updated: January 29th, 2018 — Please nag me for fixes and updates. To my surprise, I couldn’t find a truly complete, definitive, master list of all the horror video games that were ever created anywhere online. At first glance, that may seem like an impossible, certainly daunting task, but not really if you think about it. We’re talking about one of the mediums of storytelling with the least amount of titles in it already because of the complexity of making games, but then also just one genre within that medium. By the time we get everything listed, I don’t even think we’ll hit the 1k mark. Also, there were only X amount of games ever created in the past, so eventually we’re going to be able to check off that part of the list for good. Then, it’ll only be a matter of keeping up with the latest titles coming out. I’m not saying it’ll be easy and that there won’t be pitfalls, some I’m already aware of and some I haven’t thought of yet, but I think it’s a very doable goal. If you’d like to help out, simply comment below to let me know of any titles I missed or about any other errors or typos you find. 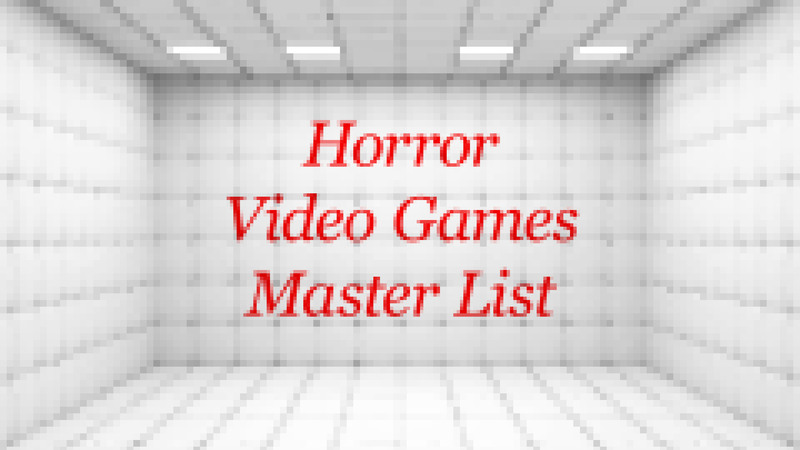 While still incomplete, the list I’ve put together below is now the most complete, organized, and consistent list of horror games that can be found anywhere. And this is just the first draft. Data researched, collected, and combined from Wikipedia, IGN, Google, developer websites, and my own personal knowledge of games. But those sources are pretty much tapped now. Another major issue that’s plagued horror video games over the years, is that major publications, still in 2016, have not given these games a proper genre. They’re almost always listed under “Action,” which simply isn’t accurate and hides proper horror games among the more popular and many actual action games. For a while, “Survival Horror” was coined and was a little more helpful, but really, just a sub-genre of horror. It’s so bad that I once said “I love horror video games.” on social media and was met with confused comments like “What’s a horror video game?” because horror is not seen as an official kind of genre, though it clearly is in actual reality. Only with your help, can we ever finish it and make it truly definitive. The reason being is that for most of the major gaps, I was only able to fill from my own personal knowledge, so I suspect the remaining gaps can only be filled by other individuals who are able to point out horror games they recall playing that aren’t yet listed.